According to the engineering regulations, the durability and design of the structure lifetime is around 50 years. Its lifetime is extended by regular maintenance or otherwise it should be demolished and rebuilt. By using MCI® technology in severely corrosive environments, structures will have a stronger resistance to corrosion and therefore longer durability. Increased durability means fewer repairs, enhanced structural integrity and a longer service life, all leading to greater sustainability. Corrosion is natural force that can be life threatening. Essentially, corrosion is the deterioration of materials over time. It is huge problem for engineers who frequently use metal products in their structures, because it can be a safety hazard. Sadly, latest event of bridge collapsing in Italy demonstrated how neglecting this powerful force can have tragic consequences. Something went very wrong with the Morandi bridge in Genoa, which was completed in 1967. Engineers brought out numerous concerns about its unusual concrete-encased common steel cables. Designer of the Genoa bridge warned four decades ago that it would require constant maintenance to remove rust, given the effects of corrosion from sea air and pollution on the concrete. Also, the problem of the fatigue corrosion of metal elements, which is particularly insidious in steels of high mechanical strength such as strands, is still a little-known subject. Morandi Bridge is the fourth bridge that has collapsed over the last few years and this sends us an urgent warning. “As this reinforced and prestressed concrete bridge has been there for more than 35 years, it is very possible that corrosion of tendons or reinforcement is a contributory factor,” said Ivana Liposcak, Cortec’s MCI® technical support manager for Europe. “The long-term behavior of viaducts subjected to heavy traffic and situated in aggressive environment shows that at the time of planning obviously many concepts about the sustainability of the bridge were not known and considered. Due to the vibration in concrete, microcracks occur, through which the moisture leads to oxidation and corrosion of steel and in that way, structure gradually loses its capacity due to corrosion” noted Liposcak. In spring of ‘2000 in North Carolina as people were making their way back to the parking lot across the bridge, concrete and steel walkway snapped in half. After an inspection, it was determined that all 11 steel cables that were holding the bridge together were corroded, and the bridge bustled under the weight. The corrosion was caused by too much calcium chloride, an inorganic salt compound that’s highly corrosive to steel, mixed into the grout that cemented the bridge’s steel cables in place. Nearly 50 lawsuits were filed against the speedway and the construction company with settlements of millions of dollars. lower, cars were smaller and lorries much lighter”. Harsh weather conditions, such as heat, cold, floods and high winds buffeting all contribute to corrosion of bridges. This is why regular inspections and maintenance are essential. How we build sustainable and durable structures? During last two decades there have been huge advances in technology to extend the lifespan of structures and avoid possible tragedies to happen. One of the most efficient uses of migrating corrosion inhibitors (MCI®) are when applied directly during construction phase as well as a part of the maintenance repair system in existing structures. For prestressed structures for bridges, MCI’s are recommended for the protection of prestressed cables before grouting such as Cortec’s MCI 309. Sustainable construction has become a goal for owners across the globe. Often overlooked aspect is the durability and service life of the final structure. However, this is undoubtedly one of the main factors influencing structural sustainability. MCI ® inhibitors are made from a renewable raw material, enabling users to earn certain LEED credits. 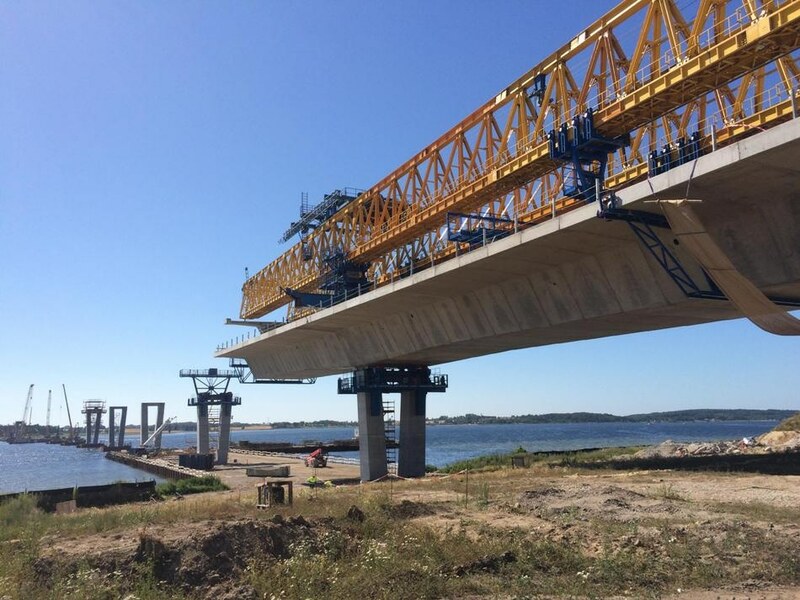 There are many current cases of using migrating inhibitor technology in projects around the word such as erecting the new Frederikssund bridge in Denmark (picture right). The aim is to replace the old bridge built in 1935 by providing an alternative to the only currently active bridge over the fjord. The project includes design & construction of an 8-km-long dual-carriageway highway, comprehensive of a bridge over the Roskilde Fjord. MCI® 309 is used for corrosion protection of PT concrete segments. MCIs are based on amine technology. They are classified as mixed inhibitors, meaning they affect both anodic and cathodic portions of a corrosion cell. MCI® is applied in many forms including as a concrete admixture or a topical treatment. It moves as a liquid through the concrete matrix via capillary action and migrates in a vapor phase throughout the concrete pore structure. When MCI® comes in contact with embedded metals, it has an ionic attraction to it and forms a protective molecular layer. This film prevents corrosive elements from further reacting with the reinforcement and also reduces existing corrosion rates, greatly extending concrete service life. The Maslenica Bridge in Croatia is one of the largest bridges of its type with an arc of 200 meters (218.7 yd) in diameter. Because of the aggressive environment of changing temperatures, constantly fluctuating humidity, and strong wind containing salt from seawater, reinforcing steel had started to corrode, causing concrete spalling. To restore the bridge and prevent future corrosion from happening, all spalling concrete was water-blasted off, along with dirt and corrosion on the rebar. CorrVerter® MCI® Rust Primer was brushed on exposed rebar to passivate the metal from further corrosion, and MCI®-2020 was applied to the entire concrete structure using an airless sprayer to prevent any potential corrosion that was not apparent. If the world was made of Lego bricks, building of bridges would be perfected and perhaps they would never collapse. In the real world, every project is different. Geology, weather conditions, volume of traffic, available construction material affect design and construction. Today we are lucky to have huge advances in corrosion protection that can be applied in construction industry. We have to utilize them properly for the benefit of all of us.